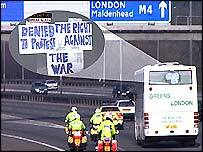 Judges are hearing two appeals over police actions in stopping an anti-war demo days after the Iraq war began. 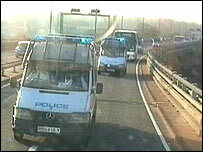 Around 120 people were escorted back to London after trying to demonstrate at RAF Fairford near Swindon in 2003. The High Court ruled in February that the police were entitled to turn the protesters back, but acted unlawfully by detaining them on their coaches. Both protesters and police believe they acted within the law and are arguing their cases at the Court of Appeal. Lawyers for the demonstrators say the ruling "erred in law", both in relation to forcible detention and denying their right to protest. Michael Fordham, representing demonstrator Jane Laporte at the court on Thursday, said both aspects of the case were important. He said: "The police have failed to demonstrate that the action of preventing Ms Laporte from attending the demonstration was necessary in a democratic society in order to prevent a breach of the peace." Three coaches were stopped and searched on 12 March 2003, shortly before they arrived at RAF Fairford where American B-52 bombers were based. Protesters were told to return to London and their coaches were escorted by police for the journey back. In February the High Court backed the argument that police were entitled to take preventative action if they "reasonably and honestly believed" there would have been breaches of the peace. But protesters, supported by human rights groups Amnesty International and Liberty, say the High Court ruling means anybody can be turned away from a lawful protest on the whim of police. Jesse Schust, 32, from Highgate, north London, told BBC News Online they were prepared to take the case to the House of Lords and the European Court of Human Rights if necessary. "I feel strongly, not so much about what was done to us, but the implications for all protests if this is allowed to stand as law," he said. Gloucestershire Police are also at the Court of Appeal challenging part of the ruling. The High Court ruled that police abused common law when they "detained" the demonstrators by escorting them back to London. The force has said the operational commander that day acted "entirely in good faith" and was following his duty when he turned the coaches away. In a written submission Simon Freeland QC, for the force, states that the officers were "obliged" to act in the way they did. He said the High Court ruling would make the police "powerless to prevent a breach of the peace that would, potentially, have had extremely serious consequences". The police officer in charge would be under a duty to turn the coach back, but unable to take the only practical measures that would have achieved this, he said. "That illogicality is not only contrary to effective and efficient policing in a democratic society, it is also contrary both to established legal principle and to common sense," he said.